- I cleared out about 6 percent of my old email. This sounds small, but it it's a very full Gmail account. - The clothes waiting to be put away, are at last, put away. - Pintrest has me hooked, and I'm enjoying building boards of inspiration. Find me here. - A trip to the Post Office reminded me that I do love the patient and kind people that work at the small branch my me. - I realized that February has been flying by and I have some deadlines looming. Yikes. How has your Saturday been? I hope well. Now, I think I had better continue with this progress that I'm making! I'm glad you had a productive day! I was proud of myself too ^_^ I tackled a laundry basket of odds and ends I was avoiding like the plague since I moved in October, added some vinyl decals to the bedroom wall and spent the rest of the day knitting and listening to 80s music, watching a John Hughes documentary and having Pretty in Pink cupcakes... hurray for Saturday! 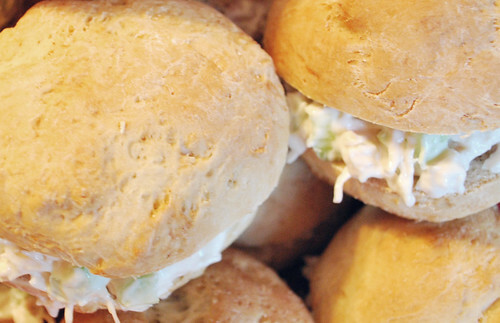 Except for those awesome chicken salad sandwiches...those are making me drool!!! Yuuummmmmyyyy!! !